In honor of SF Beer Week, I’m making it my mission to drink as much local beer as possible (while pushing it on others) and accompanying it with tasty, beer-enhancing snacks. This weekend Beta Wife and I made a drool-worthy batch of homemade soft pretzels, and we paired their salty, buttery goodness with a tasty IPA…from a can. 1. Add 1-½ cups of the flour and yeast to a large mixing bowl. In a small saucepan combine the milk, sugar, oil, and tsp salt, and heat until warm (120º to 130º). Then add the milk mixture to the flour mixture. Mix with an electric mixer on low/medium for about 30 seconds, scraping the side of the bowl. Beat on high speed for 3 minutes. Stir in as much of the remaining flour as you can with a wooden spoon. 2. Let the dough rest a minute while you grease a large bowl with cooking oil. Then move the dough onto a lightly floured surface. If you’re not used to making bread by hand, make sure the surface is sturdy; kneading dough is easier when your base isn’t moving. 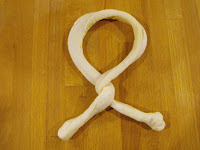 Knead in the remaining flour until you have a moderately stiff dough that is smooth and elastic. Shape into a ball. Place the dough in the greased mixing bowl, turning once to cover the top of the ball. Cover with a (clean) dish towel and let rise in a warm place. In about 1 hour the dough should roughly double in size. If you poke it with a couple of fingers and the indentions remain, it has risen enough. 3. Now for the funnest [sic] part. You get to punch the dough. Hard. (I mean, literally, you punch the dough, people. No joke.) 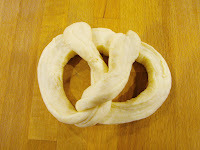 Then place the dough back on a lightly floured surface, punch it down (fold it a few times and press it down; almost kneading it for a minute), and let it rest for 10 minutes. Grease baking pans or line them with parchment paper, then set aside. 4. Pre-heat oven to 475º and start bringing a large pot of water to boil with 2 Tbsp salt added. You only need enough water to keep the pretzels floating, so add water until just shy of half full. 5. 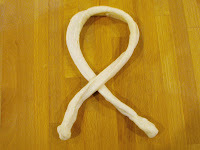 Roll dough into to a 12x10 inch rectangle, then cut into roughly twenty 12 x ½ inch strips. Take the strips and work them into a longer rope by gently pulling them until they reach about 16 inches, or until you have enough to work with. 6. 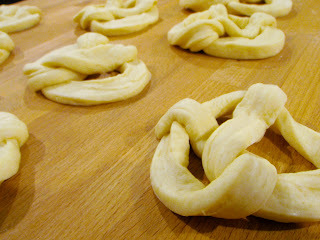 Shape into pretzels, as shown by my helpful photos, and place the pretzels on the baking sheets. Bake for 4 minutes, remove from oven and begin boiling in batches of about 4 at a time, depending on size. Total boiling time is 2 min, cooking the pretzels 1 minute on each side. Meanwhile, lower oven heat to 350º. 7. Transfer pretzels with a large slotted spatula to a drying rack, letting the water drip off. Return to baking pans. If you used parchment paper, there’s no need for a fresh sheet, just use them again. 8. Beat the egg white together with the 1 Tbsp of water. 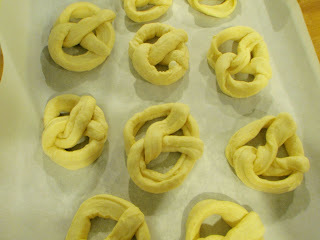 Brush the pretzels with the mixture and lightly (or in our case, heavily) sprinkle them with kosher salt. 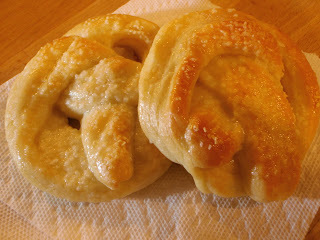 Bake at 350 for 20-25 minutes, or until pretzels are golden brown. 9. Remove from oven. Heat 2 Tbsp butter in a small dish, brush over pretzels. Let stand just long enough so that you won’t burn your mouth. Enjoy with ice cold can of IPA. 1. Don’t cover the pretzels while boiling them, even if you’re having trouble keeping the water hot enough to boil. Overheating them causes them to shrivel, making them look funny and giving them a tougher, chewier (in a bad way) texture. Same goes for over boiling (no more than a minute on each side.) A slow, wimpy boil will do the trick in the end. 2. The shapes don’t have to be perfect to taste good. 3. If you have two pans in the oven at once, top and bottom, make sure to rotate them halfway through baking. 4. Get someone to do the manual labor for you, like all that pesky kneading, and measuring things. Boring. Just show up for the fun parts like punching the dough, shaping the pretzels, and tasting things. 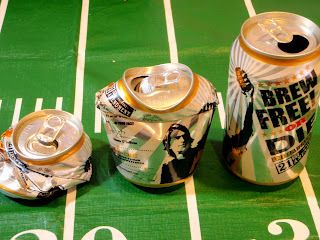 actually beer from a can is supposed to be fresher than from a bottle. i love it from a can (although i can't drink it from the can--i pour it in a glass). this sounds yummy. wish i was in sf.